The ISI 2015 Organising Committee appreciates the efforts of all our supporters and partners in promoting our conference. 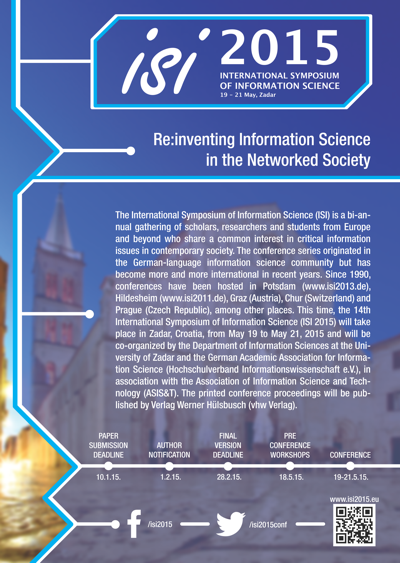 Please find below flyers, advertisements and banners that can be placed on webpages and included in e-news to advertise this upcoming international symposium of information science. Click the images below to download the high resolution versions. If you would like specific support and materials to promote ISI 2015, please do not hesitate in contacting the conference Managers by sending an email to isi2015@unizd.hr.